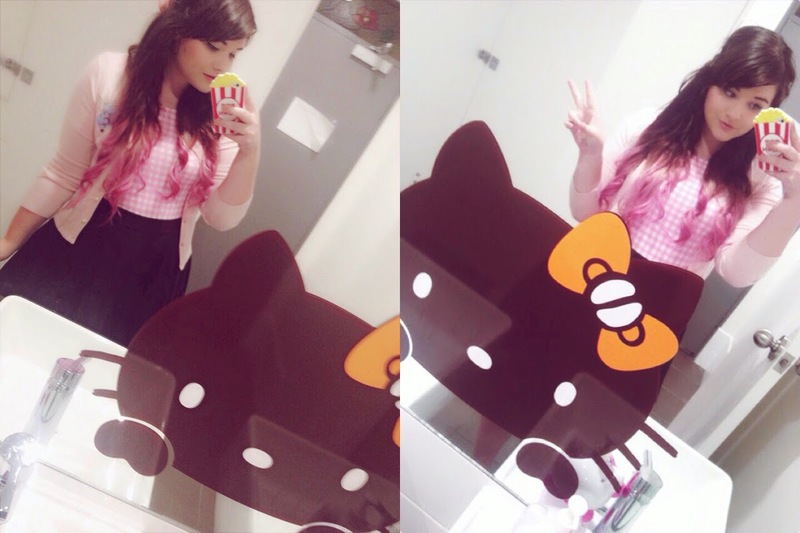 After what seemed like ten years of waiting, Sam and I finally got to visit the first Australian Hello Kitty Café in Adelaide! As you may have already noticed, I'm a real sucker for anything cute, and while I may be firmly on the Rilakkuma wagon there's no way I would pass up an opportunity to hang out with everyones favourite cat girl. I didn't get to take any photos of the decor because it was quite crowded and I didn't want to look like a weirdo, but I did take plenty of our food! I had the fruit eclair and it was huge! I'm not very good with eyeball measurements but I think it would have had to have been at least twenty centimetres long and stuffed full of summery fruits. My favourite part was definitely the macaron though, I think it was green tea flavoured and it was super crispy on the outside and chewy on the inside - the perfect macaron texture - and the little pink bow was chocolate. The drink I had was called a Surfed Baby. 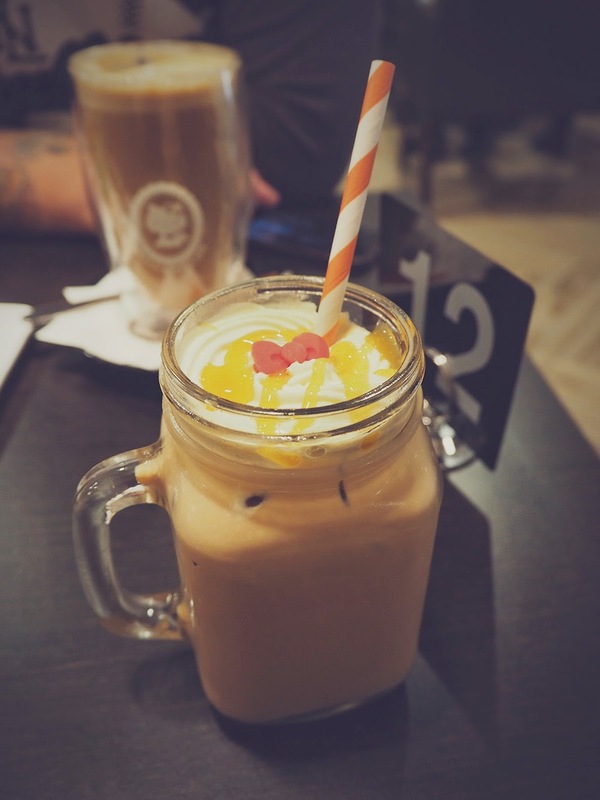 It was a caramel milk tea with hints of honey, topped with cream, caramel sauce, and another pink kitty bow. We went on a particularly dreary day and this baby sweetened me up significantly, if you visit the café I would definitely recommend trying it! Sam had the Chocolate Potty, which was a layered dessert made up of chocolate spongecake, ice cream, crushed oreo 'dirt' and meringue 'mushrooms'. I only got to try a mouthful because it disappeared so fast, so I think that means it was delicious! And of course, what's a trip out without some bathroom selfies? I'm pretty excited to try everything on the menu so I've no doubt this will turn into a series of posts haha. The only thing I didn't like was how noisy it was, but that can't be helped I guess, and it was a little bit pricey but you do get a lot for your money so that's justified as well. If you're a fan of the cuter things in life, make sure you check it out!